Excellent picture. It's hard to find a chain saw on some of the jobs here anymore. I sure endorse them for still doing some of the better quality work. How about expaining some of your "colorful" clothing and its purpose, i.e. the Kevlar boots etc. And the Hat! Don't forget the hat! I wouldn`t consider operating a chainsaw without every available safety device. I wear chainsaw protective boots, chaps, gloves and hardhat when operating any chainsaw. I try to wear bright colored clothing so other people that I may be working with can see me from a distance. The work as you know is dangerous enough without taking unnecessary risks. When I get tired I quit and go back another day or put the chainsaw away and do something else. I think if we keep informing people of the dangers involved we`ll get a few to buy the stuff and wear it. If a few think it`s too costly, I say ... try having an accident ! Jeff, I knew you would spot that sooner or later, that was for the photo opp. right on with the woods work be careful info. i go into the woods fresh and rested, wear orange hard hat and protective shirt. no drinking the night before. best advice might be to think and plan. trees come down fast and hard and are not forgiving. also if something doesn't feel safe it probably isn't. Hey Kevin, I've been looking for boots that have kevlar, steel toes and paks. I can find steel-toed paks, but not with kevlar. Do they have anything like that in your neck of the woods? The boots are from Husqvarna, my local dealer stocks a pretty good supply. These are kevlar, steel toes and paks. Excellent Safety Tips for chain saw users from those with sawyer experience. The bright colors are life and limb savers. Cedar-Eater, if your ever down this way near Ebels' Hardware Store in Falmouth, MI, they have them. They're a popular Husky dealer in this area. John Deere 548 G Grapple Skidder. Tree length skidding Red Pine. John Deere Grapple Skidder. 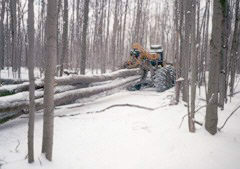 Tree length skidding hardwood pulpwood. 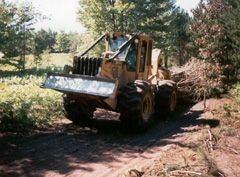 Timberjack Cable Skidder. 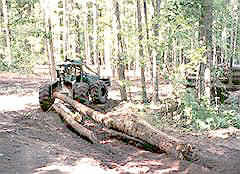 Small size, skidding tree length logs and pulpwood. 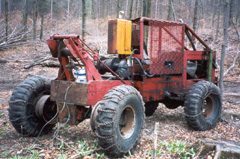 Cable Skidder, Older model, home built. Young pig, around 200 lbs. 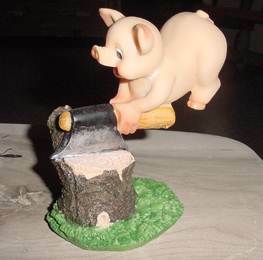 THIS PIG DOES NOT COUNT TOWARDS CONTEST! 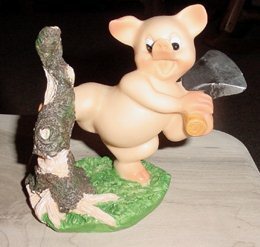 Another Pig Trimming stump height to please the consulting forester. A good ending to this Thread as it dies for lack of interest! It's not dead yet. What's that homemade rig built out of? It looks good. Sombody put a lot of time into it. That Timberjack looks to be from a distance the same model I've been running for the last two winters. Works great in hardwoods. The guys who own it have sold it and it goes down the road Monday . Glad I'm almost done with it. You losing interest, Ron? I'm not! 568 reads says somebody's interested. Would be nice if someone else would chip in a pic or 2, though. Thanks for the ride. Hey Ron Got any more info on that or another home built skidder? I just had to pipe in here with a great book. Handloggers by W. H. Jackson. I've only been able to find it as a collectors item for big dollars, but if you get a chance to read it, do. It takes place in S.E. Alaska in the 50's and 60's. The technique at the time was to find a nice stand of timber that was growing on a steep hillside above saltwater and either fall the timber directly into the water or slide it down the steep slope into the water. Often the tree would hang up and he would have to jack it loose so it could continue on its way. He and his wife would live on their little troller (boat) and raft up logs until the order was filled, then tow it to town. Steve,I read that book several years ago.I really enjoyed it.That independence,and the chance to make a few buck in the process is appealling.I wonder what would happen if we fell trees directly into fish habitat these days? Page created in 0.972 seconds with 40 queries.